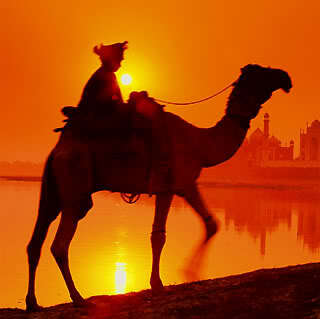 Discussion in 'Ride Reports - Epic Rides' started by Joliet Jake, Jun 4, 2006. This is a 7000 mile trip through the western United States on my 1999 BMW F650. It took me 4 weeks starting on May 7, 2006. It fulfills my long time dream of taking a solo long distance motorcycle journey. My plan was to ride from the Rio Grande River to the Canadian border and back, exploring the best motorcycle roads and visiting as many national parks as I could. I have flown over the western USA many times on business trips, but only rarely have I seen anything but big cities and ski resorts. This is my journey to see America. It's a long report. Grab a Snickers, this will take awhile. I stop at the Lost Maples Cafe in Utopia, TX. There is a KTM and a KLR parked outside, and one of them has a "FYYFF" sticker emblazoned on each pannier. This must be the place to eat! I eat a burger and meet two ADV guys, Crowbocop and 02Silver, who have a cool helmet to helmet communications system. Believe me, it is. The only difference between Highway 170 and a roller coaster is the liable party. Turns on roads usually have yellow arrow signs ahead of time to give you an idea of which direction the road is going. Highway 170 doesn't do that very often. You come over the crest of a hill and you don't know what's going to happen next. Your stomach drops just like it would if you were on a roller coaster. If you go to Big Bend, you must ride Highway 170. You've seen this picture on advrider before. It's architectural art located 38 miles west of Marfa, TX on Highway 90 in the middle of nowhere. Adios Pantalones Gordo tonto y contento. San Diego, not Mex, but I can smell it from here. Camelbak and a custom saddle are money well spent. The most embarrassing thing about my trip was not the time I almost dropped my bike onto a gleaming yellow Harley in front of a cafe full of onlookers, nor when I exhibited flatulence during a quiet moment on the tour of McDonald Observatory. No, dear reader, there is nothing more embarrassing about my trip that I could tell you than the fact that the Area 51 museum got my two dollars. I got taken. Most people don't admit to things like this because they want others to experience the same shame, but I don't mind. Do not go to Roswell for the UFOs. Eating a bucket of KFC chicken while watching an X-Files re-run would be ten times more rewarding. I pull into a primitive campground, dismount, and begin walking around looking for the perfect campsite. I hear a loud "CRASH" behind me and turn around to find that my bike has fallen over. The ground is uneven, and the bike was almost vertical on a sloped grade. The bike must have rolled forward ever so slightly on the downward grade, and the side stand no longer supported the weight. I have a nice little dent in my aluminum pannier as a memento. Luckily, I carry spare levers. I don my REI mosquito head net (complete with camouflage yarmulke! ), and it takes only ten minutes to replace the clutch lever. Lessons learned: 1. make sure your bike is leaning onto your sidestand, not close to vertical. 2. carry spare levers. Despite the negative imagery, I am feeling good about today. I should see some amazing scenery as I dip into southeastern Utah, including Monument Valley. It feels good to not have to grind out miles and just see the sights. Next stop is Navajo Twin Rocks in Bluff, Utah. It is a tourist trap that can be avoided if you are in a hurry. 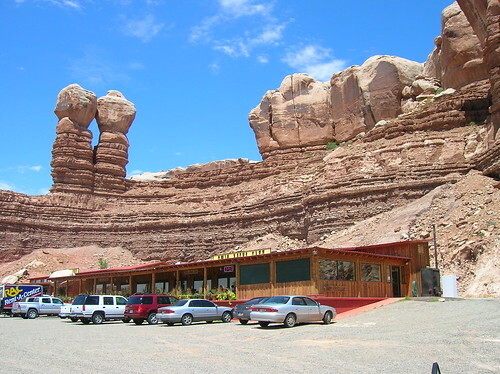 Developers built a restaurant and gift shop at the bottom of a unique rock formation and piped in Navajo flute muzak. This one gets 5 (count 'em) stars. Great Report! Keet it coming! I limp 5 miles to the small town of Mexican Hat, Utah. I check into a hotel and immediately fire up an Internet connection. The hotels in this part of the country use satellite dishes for Internet access, so the connection isn't the fastest. I order a new tire from swmototires.com in Tucson, AZ and have it shipped overnight via FedEx. The problem is, it is early evening, and the order won't be placed until tomorrow morning. Furthermore, FedEx priority overnight in this part of the country doesn't mean next morning, it means sometime before sunset. So now I have two days to kill waiting for my new tire. I spend the next morning performing maintenance on the bike. I discover that my lower chain roller has completely disintegrated, so I swap it with the upper one which is still intact. The rubber cover on my left footrest has fallen off, but that is no big loss since the right one fell off long ago, and now both sides match! I tighten the steering head bearings and make sure everything else is ship shape. Mexican Hat is the quintessential dusty western town. Everyone knows everybody else and occasionally you see someone riding down main street on horseback. There are two restaurants, a gas station, and no stoplight. Soon everybody knows me as the guy from Texas waiting for the motorcycle tire to arrive. The locals explain that FedEx can be hit or miss in this part of the country, and even the Post Office forty miles away cannot guarantee delivery within a certain timeline. I eat at the same outdoor chuckwagon restaurant both nights. The cook wears a cowboy hat and a bandanna around his neck and cooks over an open fire. The waitress jokes that I have my own table now. This isn't such a bad place to break down. The San Juan River runs right behind my hotel, and everyone here is very friendly and accommodating. Even the locals tell me that this is a lot like the Australian outback. Thanks, Southwest Moto and Federal Express... you rock! This is my F650. There are many like it, but this one is mine. My F650 is my best friend. Without it, I am useless. I mount my new tire, and I'm ready to hit the road and see Monument Valley. But first, one last breakfast in Mexican Hat, Utah. These Swedish bikers razzed me for not riding a Harley, but one of them stayed behind after the rest departed and told me he didn't like his rented Harley and missed his F650 Dakar at home. It's hot as I make my way across Marble Canyon among the Vermillion Cliffs, but then the temperature drops once I enter Kaibab National Forest. I choose the north rim of the Grand Canyon because there are fewer people than the south rim. I finally get to see the Grand Canyon from a vantage point other than 35,000 feet. Bright Angel Point, north rim of the Grand Canyon, Arizona. Next stop is Zion National Park. The ride into the park is nice with switchbacks and twisties, but the park is crowded. So crowded, in fact, that the only way to see the heart of the park up close is to take a ninety minute propane-powered shuttle bus that moves at a glacial pace. My ride into and out of the park is more fun than sitting on the bus. Bryce Canyon National Park is next. There are lots of people here, too, but the nice thing about Bryce is that most people stay near the entrance of the park where charter buses are permitted. I ride the entire eighteen mile length, and thankfully the remote areas of the park with its spectacular views at Rainbow Point are sparsely occupied. Soon this park will have shuttle buses, too, because it is being overrun. If you're strapped for time, head straight for Bryce Point to see the amphitheater of hoodoos. Hoodoos at Bryce Point, Bryce Canyon National Park, Utah. As I'm refueling in Escalante, UT, a shiny black Ford truck pulls up next to me and a guy with tattoos up and down both arms asks me, "Are you the guy who needs the new battery?" I say it's not me, and he hands me his business card. It turns out he is the famous "Desert Doctor" you have heard about on advrider before. He owns the only bike shop for 200 miles. It's obvious he has his PR campaign down to a science, and he tells me to let every rider know about him. The next time you are refueling your bike in Escalante, UT and a guy in a truck asks you, "Are you the one looking for the (tire/battery/whatever)?" please say, "YES! I can't believe you found me." I want to know what his next line is. I ride highway 12 through checkerboard slickrock formations and then ascend to the chilly summit with great panoramic views. Highway 12 is definitely worth a ride. Traffic jam on Highway 12, Utah. Highway 24 after exiting Capitol Reef National Park, Utah. I'm miserable as I ride out of Capitol Reef National Park because it's 95F and windy. I want to go to Moab, and my original route was to take Highway 95 south to Blanding, but now I am considering taking the shorter route on Highway 24 instead. While refueling at a gas station, a rider from Colorado tells me that the shorter route is boring and that I should take Highway 95. Highway 95 from Hanksville to Blanding, UT is the best desert road I have ever ridden. While Texas 170 is pure kinetics, Utah 95 combines twisties with stunning scenery of Glen Canyon that is up close and personal. You feel like you're in a video game. I soon forget that it is 95F. Book your tickets now. I ride to Natural Bridges National Monument and try to muster the will to take pictures, but I am reaching my saturation point. One of my friends has an analogous term for it when touring Europe: "ABC", or "Another Bloody Church". After you tour so many churches or castles in Europe, you just can't take another one. I can't take any more geology. No more plaques about rocks, minerals, fossils, sandstone, limestone, or the Blarney Stone... that's it, I'm done. The only fossils I care about now are the refined ones I put in my 4.5 gallon tank, and the only geology I want to know about is the beautiful scenery going past me at 75 miles per hour. I ride to Moab and join a cavalcade of dirt bikes, ATVs, humvees, and Jeeps as they file into town from every direction like some kind of haj. An unseasonable heat wave has parked itself over the Colorado Plateau, and it's 95F in the shade. I'm wearing ATGATT touring gear. I decide not to ride offroad. It's too hot, there are too many people, and I will have plenty of opportunity to ride dirt in beautiful weather in Montana. I do not feel comfortable riding offroad by myself on Metzler Tourance tires in 95F heat. I'll save Moab for a group tour in nicer weather sometime in the future. After being on the road for two weeks, I decide what I really need is to get out of the heat and off the bike and recharge in the big city. I ride quickly through Arches National Park and then head to Salt Lake City. The temperature starts to cool down as the mountains approach in the distance. My spirits are starting to lift. I don't even mind that there are long straightaway sections of highway because the cool air feels great, and things are turning green again. As I'm riding into the city, I happen to look down at my odometer at the exact moment it rolls over to 24,000 miles. Time for an oil change! I couldn't have planned this any better if I tried. Highway 6 on the outskirts of Salt Lake City, Utah. I check into a swanky downtown hotel with modern fluffy beds and oatmeal flakes in the soap. The great thing about staying downtown is that everything is one block away. I finish the book I'm reading, so I go to a bookstore and buy another one. I see a movie, do laundry, and lift weights. I have a fantastic Italian dinner and sleep in the next day. So far on this trip, most of my lunches have come from convenience store refrigerators. Lunch consists of those triangular sandwich wedges that come in vacuum packed plastic. I've developed quite a taste for them. There's a scene in Long Way Round where Ewan jokes that after the trip is over, he and Charley will continue to meet at petrol stations. I am starting to feel the same way about my lunches. I wonder if after I get back when my friends ask me to lunch, I'll say, "Sure, let's meet at the 7-Eleven on the corner of 12th and Main... they have a great ham on rye there." After a day and a half of R&R, I decide to get my oil changed on my way out of town. I ride to BMW of Salt Lake and ask the service manager if he can squeeze me in. He walks back to the shop to see what's on the docket. Even if he says no, I have a kit and can do it myself, but I'd rather indulge myself and let someone else do the work. He returns and says that the tech is in between projects -- the next one being the disassembly of an LT. "Your timing is impeccable," he says. I spend two hours drooling over BMW apparel that my local dealer doesn't carry because of contractual issues. Shaggy the dog greets customers at BMW of Salt Lake. I depart Salt Lake City. My riding gear is clean, my bike's oil has been changed, and my mind and body are rejuvenated. ThomD Is this thing on? I depart Bozeman, MT after briefly driving past the university as an homage to Robert Pirsig. It's starting to sprinkle, but I leave the thunderclouds behind as I head east. I take 78 from Columbus, MT to 212 and then the Beartooth pass. It's overcast, so I don't think I get the full effect. I stop at the summit at the scenic overlook and laugh because there are ten spotless sport touring motorcycles parked here, and then there's my Filthy McNasty Rat Bike with three weeks of grime all over it. A helpful rider from Billings, MT educates me about the two passes I will cross next. It's overcast and very cold crossing the two passes, but I enjoy the scenic descent on 296 into Cody, WY. As I cross into South Dakota, I see Confederate flags and lots of chrome, and nobody is returning my waves. My next stop is Mount Rushmore. I ride to the summit of 244 and see the parking garage for the monument. But I don't see the monument. I make a U turn and that's when I see Mount Rushmore. It is tiny, which is why I completely missed it as I rode by. All of the pictures you have seen of it were taken from a helicopter with a telephoto lens in good light. It is very underwhelming. Agate Fossil Beds National Monument visitor's center. Today is the last day of my trip. It's an easy 3 hour ride from Abilene to Austin. I make an effort to stay focused and not let my mind wander. Flashbacks to the end of Easy Rider come to mind. It's a good thing, too: I see a truck in the opposing direction experience a blowout and pull over to the side of the road with a billow of smoke behind his rear tire for hundreds of feet. What a great trip and ride report. Thanks. I'm jealous. Great report. Enjoyed reading about your adventure. The slashed tire chapter was the most exciting. I guess the broken lever was exciting, too. Glad you made it back ok.
Mexican Hat.........one of my favs. The windshield bolts of the carbureted F650 are fastened with wellnuts made out of chocolate. Great writing, great pics -- hope to see more reports from you! This is one of, if not the, best ride reports I have read on this site. Outstanding. Toss the stock shock and buy a Wilbers. You'll love it. My motto is, as a rule, if a trip report starts off with a photo of the equipment - one should read it. And your report proves me right. Outstanding. During my cross country trip last summer (report can be found under `Team Two Turks`) I passed through many of the places you did and wish I could do it again. Regarding the desecration of the Twin Rocks at Bluff....I could not agree more. That was the only truly ugly thing I saw in almost 4000 miles of riding from DC to San Francisco.